Six Nations: Late Wales call-up leaves Olly Kohn "chuffed"
Harlequins second row Olly Kohn says he's "chuffed" after being called up by Wales for the Six Nations. Kohn, 31, was added to Rob Howley's squad on Friday after revealing his Welsh qualification through his late grandfather earlier this month. He told BBC Radio Wales' Back Page programme he was delighted to be involved. "It's been brilliant. I'm absolutely chuffed to bits, it's a massive privilege," he said. "If I'm being absolutely honest I never thought I'd get invited to play for an international team at this stage of my career." Wales start their defence of the Six Nations championship against Ireland in Cardiff on 2 February. 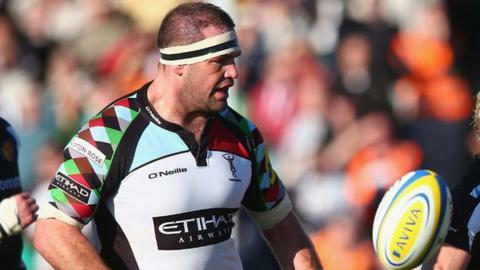 Bristol-born Kohn, 6ft 7in and 21st 10lb, played his part in Harlequins winning the 2011-12 Aviva Premiership and they are in this season's Heineken Cup quarter-finals. He is eligible for Wales through Test rugby's eligibility rules that call for birth, three-year-residency or family connections as far back as grandparents. Kohn revealed that the Welsh management got in touch with him earlier this week and asked for paperwork confirming his qualification credentials. Now he says he can't wait to meet up with the squad. "I've got to go there and meet the guys and hopefully get involved in training, show what I can do," he said. "I've only been called up to ask to train so I don't want to get too far ahead of myself. "I don't know whether I'll be involved against Ireland. I'd love to be, and it would be a massive honour, probably the pinnacle of my career." Interim coach Howley has been hit by a spate of injuries in the second row, with Alun Wyn Jones, Bradley Davies and Luke Charteris all unavailable for the opening match against Ireland on 2 February. And Ian Evans (knee) and Ryan Jones (thumb) are struggling to be fit. Backs: Tavis Knoyle (Scarlets), Mike Phillips (Bayonne), Lloyd Williams (Blues), Dan Biggar (Ospreys), James Hook (Perpignan), Jonathan Davies (Scarlets), Jamie Roberts (Blues), Scott Williams (Scarlets), Alex Cuthbert (Blues), George North (Scarlets), Eli Walker (Ospreys), Leigh Halfpenny (Blues), Liam Williams (Scarlets), Lee Byrne (Clermont).